With gas prices going through the roof and the weather staying pretty nice, I've been doing a lot of running around on my bicycles lately. 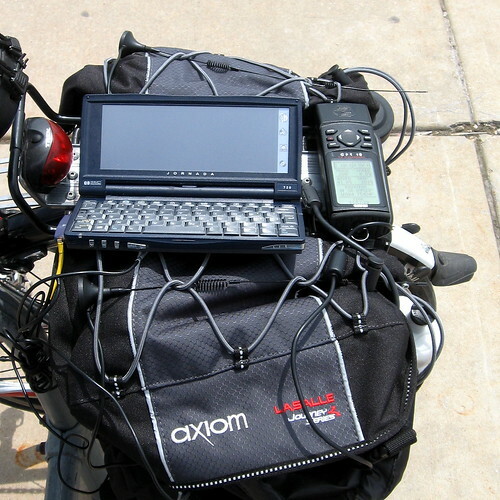 Occasionally, when I feel like riding somewhere new, I'll throw my wardriving rig onto the back of a bicycle and head out. I have wireless broadband almost anywhere in the US, and open WiFi has practically become an expected commodity at many restaurants and shops. I have no need to "steal" wireless from home users, and have no desire to go cracking WEP keys, either. Mostly, I just scan for networks for the sport and competition, logging all of the ones I find to WiGLE, where, at the time of writing I'm currently ranked 121st out of more than 4,000 people who apparently felt like uploading stumble files to WiGLE. While a bicycle certainly lacks the speed advantage of a car, the low speed and close proximity to the edge of the road gives a bicycle a distinct advantage over using a car for locating wireless nets. I also use a lot of smaller residential roads to get around. Many wardrivers miss these smaller streets, leaving behind whole blocks of densely-packed homes ripe for the picking. 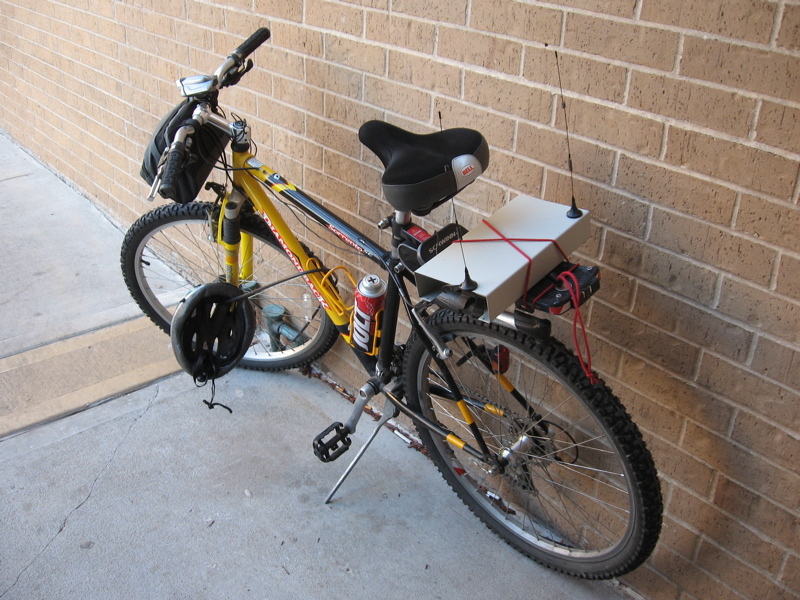 Warcycle 1.0: Mountain bike with HP Jornada 680e, Windows CE, MiniStumbler, Garmin eTrex GPS, EnGenius Card, 2x 19dBi antennae. This was taken at the March 2007 KC 2600 Meeting. 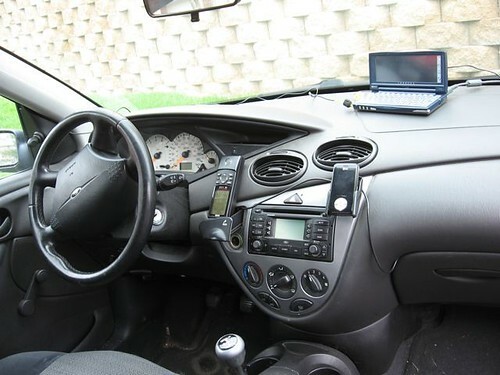 Ford Focus, Jornada 720, JLime, Kismet, Engenius card, GPS12 and dual 19dBi antennae. 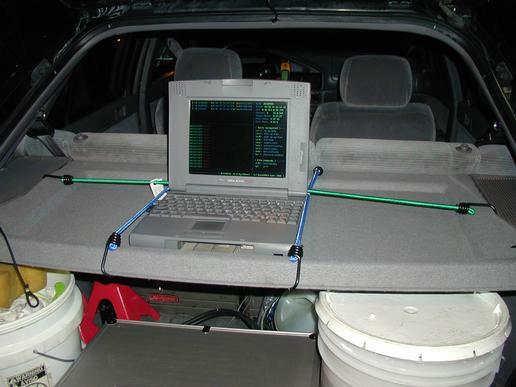 I used this rig when I went to hang out with some Hak5 guys in April. 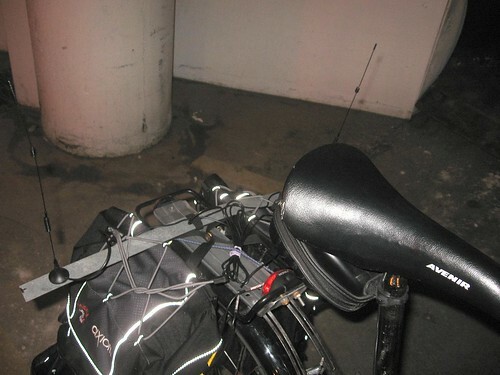 Same setup at the first photo, but with a different bicycle (Trek 1200) and the antennae are strapped to the tops of the bag. When the Jornada's tucked away, this is a stealthy setup but not quite as sensitive as having the antennae mounted upright. There seems to be a healthy following of WarDriving as a sport on WiGLE, surprisingly.